VT Made Richard's Sauces knows your privacy is important. Personal information given voluntarily while using a feature of this website, for example, during a registration process or purchase, including name, address, phone number, e-mail address, birth date; financial information, such as credit card number. 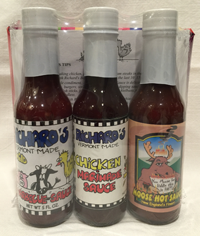 Richard's Sauces will not sell or otherwise share personally identifying information with other people or nonaffiliated companies except to provide services to you at your request, or as required by law. Richard's Sauces may disclose specific information upon governmental request, in response to a court order, when required by law, or to protect our or others’ rights, property, or safety. We do not provide information to these agencies or companies for marketing or commercial purposes. 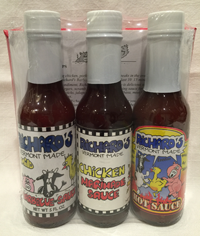 to contact and provide service to you as well as improve the overall delivery of Richard's Sauces services. In no case will VT Made Richard's Sauces use personally identifying information for its own use or the use of any other party, except to provide the services you request or as required by law. Parents should always supervise their children while online. Richard's Sauces website is not designed nor intended to collect personal information from children under the age of thirteen. So that we may comply with the Children’s Online Privacy Protection Act, we ask that children under the age of thirteen not provide any personal information on this website. Richard's Sauces has attempted to take all reasonable steps to have physical, electronic and procedural safeguards in place to protect personal information gathered through this website. This includes compliance with related federal regulations and may include use of industry-standard Secure Socket Layer (SSL) encryption to prevent any loss, misuse, unauthorized access, disclosure, or modification of personal information. Unfortunately, no data transmission over the Internet can be guaranteed to be 100% secure. As a result, while we strive to protect your personal information, we cannot guarantee or warrant the security of any information you transmit to or from our web sites, and you do so at your own risk. We value our customer’s perspective and welcome any feedback that you may have. If you have any questions or concerns, please feel free to contact us through the Contact Us tab.